Experience counts when it comes to building a high-performance Cobra. Take Rich Brandl, for instance. He’s a consummate Ford guy, working in the family business for more than 45 of his 66 years. As a kid, his parents were active automobile racers and his mother is actually listed in the Daytona Legends, racing late-models back in the Sixties. 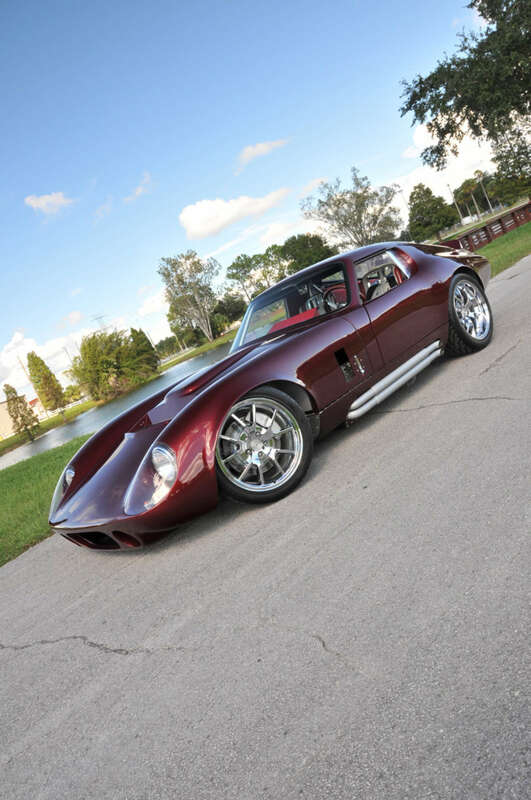 In fact, Rich’s shop, Superior Custom Classics in Hudson, Florida can now boast three generations of Brandls involved with sons and grandsons ready to carry on the tradition. 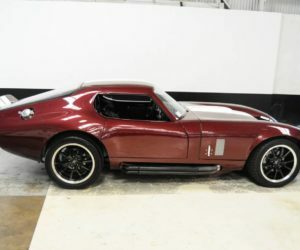 Rich, along with family members and his professional team average 12 to 15 vehicles a year, either back-to-original restorations or a full-blown customs. You don’t spend most of your life in the automobile business without acquiring a unique progression of vehicles. 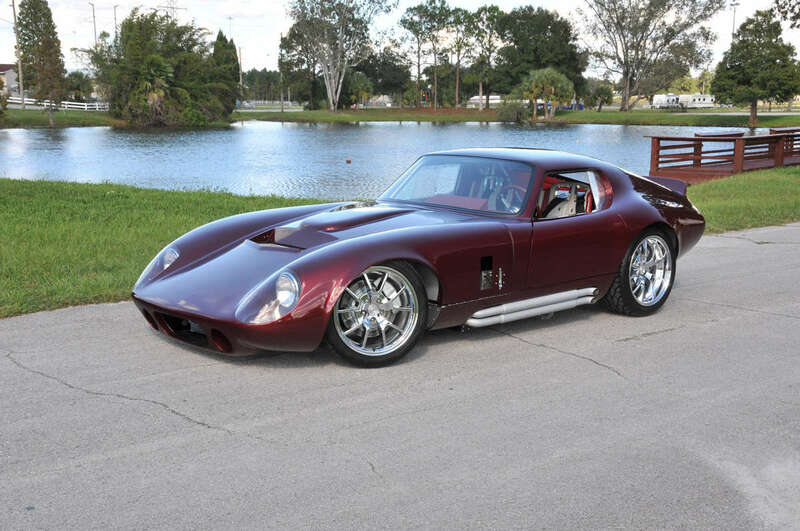 Rich has enjoyed everything from high-performance Mustangs, supercharged Thunderbirds, and custom Rancheros to three replica Shelby Cobras and finally this Daytona Coupe replica from Factory Five Racing. Since good enough is never really good enough, every one of his previous cars was brought to a unique level that makes it challenging to employ anything but superlatives. “I like one-of-a-kind cars and trucks,” he says with a smile. Indeed, his latest, this Daytona Coupe replica, would already be an amazing car in stock form, but Rich enjoys that rarefied air associated with creating something that’s out of the ordinary. 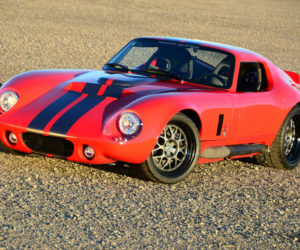 When it came time to choose, it was easy, having dealt with Factory Five Racing for many years and building several of this company’s Cobras for customers. 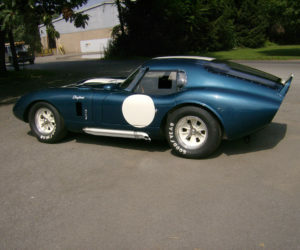 The excellent frame and suspension package on their Type 65 Coupe was one of the reasons for his choice. 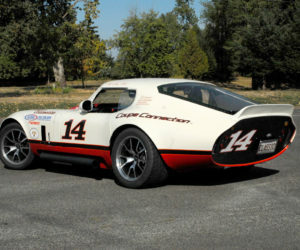 The chassis features 4-inch round main tubes combined with 2 x 2- and 2 x 3-inch rectangular steel tubing, complete with an SCCA-legal, sixpoint roll cage. He used FFR’s independent front suspension upgraded with new spindles and power steering. In the rear, a new Ford Racing 8.8 independent rear with 3.73 gears and Traction-Lok uses FFR’s shorter and heavier rear axles. 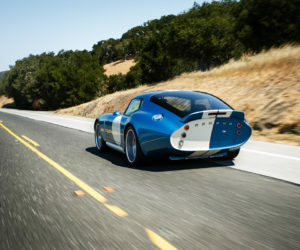 The car runs big SSBC Tri-Power 3-piston aluminum calipers with slotted 13-inch rotors on all four corners, along with Fords Hydro-boost power brakes. Rich manufactured all the brackets to adapt the calipers and added a brake bias valve positioned next to the driver’s seat. Getting the Coupe rolling are 18- inch FR500 Mustang rims, 9-inches wide up front and 10-inches in the rear, chosen initially for their similarity to the original Ford GT, and also because they were large enough to accommodate the oversize brakes. 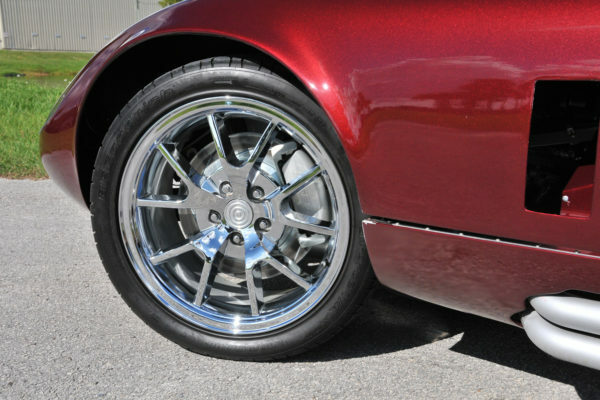 Tires are BFG with 275/35ZR18 up front and 295/35ZR18 in the rear. 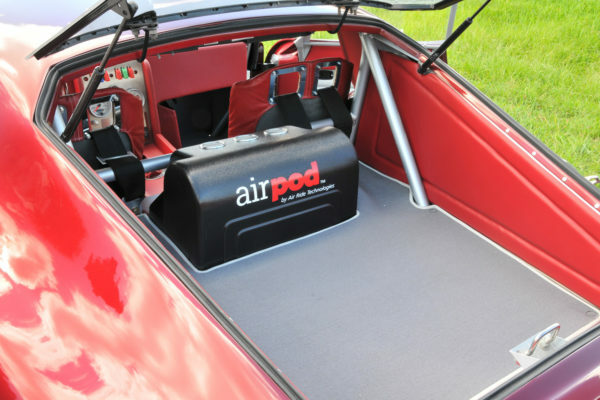 For the ultimate in adjustable altitude, the car is equipped with a Ride Tech air suspension system using Shock Waves on all four corners and a Ride Pro control system with sensors. The Air Pod control package (tank, pump, sensors) is mounted in the rear hatch area, sharing the space with an Optima battery and 16-gallon ATF fuel cell under the floor. Once stopping and turning were taken care of, motive power was next. 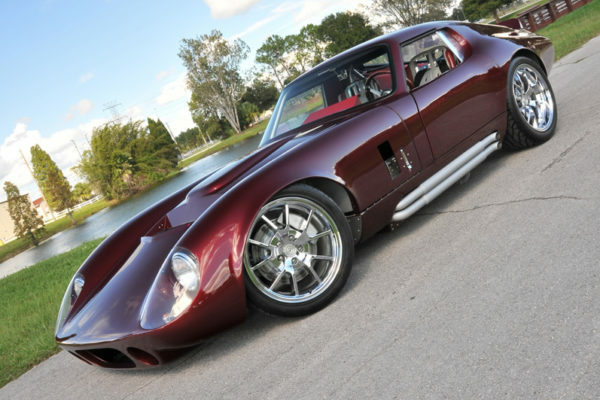 The high-performance looks of this car demanded an engine to match. Rich chose a supercharged Ford Racing 4.6L Aluminator long block rated to handle extremes as high as 1000 hp. 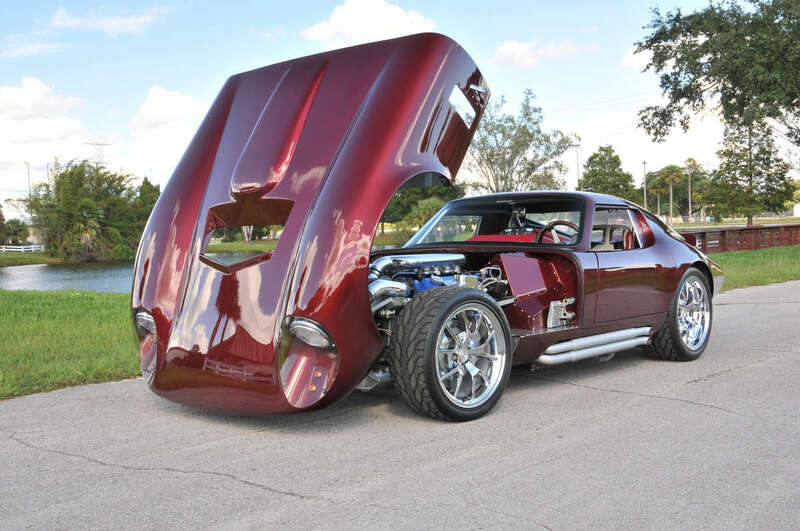 Topping the engine is a custom built, eight-stack electronic fuel injection system that he designed using his own intake manifold to hold eight 50mm Weber throttle bodies. (Since the eight 96-pound injectors are mounted inside the Webers, they still function as throttle bodies rather than merely as air valves.) The unique air to air intercooler ensures a dense charge. As a Pro Charger dealer for the last 15 years, it was a natural to add a blower to the mill. In addition to being quiet and powerful, the Pro Charger has its own self-contained oil reservoir. It’s currently set at a conservative 15 pounds but it can dial up as high as 28 pounds. Spark for the fuel/ air mix comes from the Accel Gen7 electronic ignition. For venting spent exhaust, Jet Hot coated, custom-designed headers dump into FFR’s double side pipes. Keeping everything cool is a fourcore aluminum radiator augmented with dual electric fans. 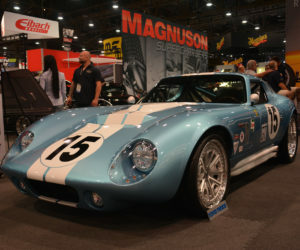 Cosmetics on the engine include Ford Racing Blue Oval valve covers and stainless name badges created by American Car Craft in Hudson, Florida. Moving inside, this ultra high-performance car boasts a surprising mix of creature comforts, such as a Bose stereo and navigation, along with Vintage Air A/C fitted under the dash on the passenger side. The dash itself is unique, created from wood and aluminum and features gauges on top that pop up or fold away at the touch of a button. 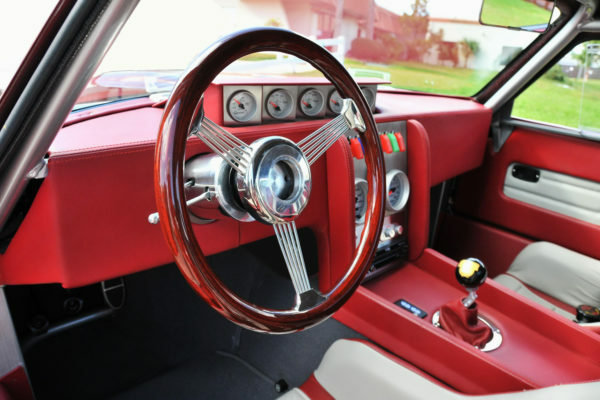 A speedometer and tach along with an air/fuel ratio gauge are mounted in the center console along with the controls for the Air Ride. Rich smiles when he describes the Auto Meter Ultra-Lite gauges, calling them “Old Man Gauges” since he appreciates the fact that they light up and are so easy to read at night. For easy entry and exit, Rich chose a quickdisconnect Grant Banjo steering wheel that rotates on a stainless steel Flaming River column. The shift knob is a collectible Golden Anniversary shifting ball, a gift to Rich from Hurst. 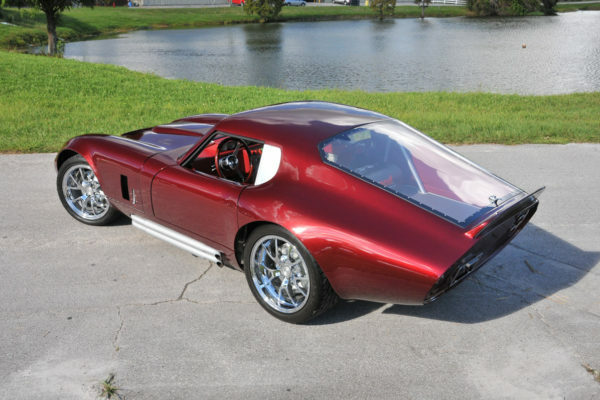 Rich Jr. created the seats using an aluminum frame, traditional GT40-style grommets for cooling, and dark red Dani leather. Door panels were crafted to match. Wrapping up the project, Rich extended the bubble on the hood to make room for the injectors. He also and added sliding Lexan side windows. The rear panel was annotated with the name of the car to help folks identify the ride. 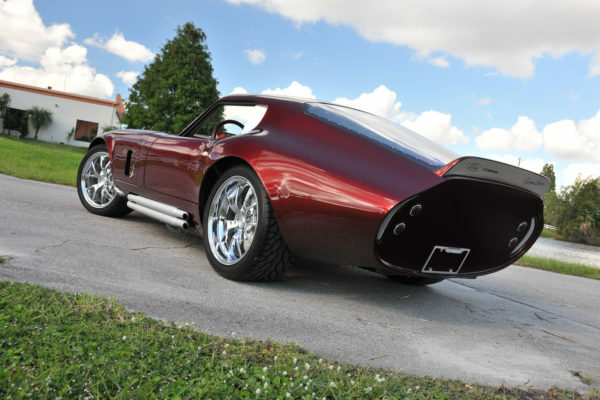 The paint is a custom mixed, PPG 3-stage, based on 2004 Thunderbird Marlette Red, a unique blend that is red in sunshine and turns maroon in the shade. Touch of Class in Hudson, Florida sprayed the base coat/clear coat. Looking back on the project, the six-year build was strictly a part-time effort, accomplished in between assembling customer cars. Rich gives a special thanks to his wife Debbie and sons Rich Jr., Clint, and David, along with grandson Alex, for their help in creating his personal best ride. What’s in store for the future? Now that it is complete, Rich says it is absolutely exhilarating to drive. In addition to spending time on the show circuit, he plans to compete in standing half-mile events to see how the car will perform at speed. So watch out for this hurricane of a coupe.